Exports, the IMF bailout and renewed investment activity have excited Mongolia-observers since last year. Now, the figures bear it out: Mongolia is recovering fast. The IMF has talked of 8% growth by 2019, but other bodies are also recognising its exceptional performance in the early part of this year (IMF). The economy expanded 5.3% in the six months to June, and in this quarter, the Asian Development Bank (ADB), revised its expectation of economic expansion up from 2.5% to 4% (National Statistical Office of Mongolia). On the back of a 43.9% increase in industrial output in the first half of 2017 – and a fourfold growth in exports to China – industrialists are preparing for Mongolia to resume its position amongst the fastest growing economies in the world. With a new Prime Minister and President both minded to reform, the stage is set for the next Mongolian renaissance. Mongolia’s economy, long driven by global commodity demand, continues to recover, with notable outperformance for coal in particular. With between US$1.2 and US$2.5 trillion of mineral resources lain under the ground, an uptick in key exports can rapidly accelerate economic growth. 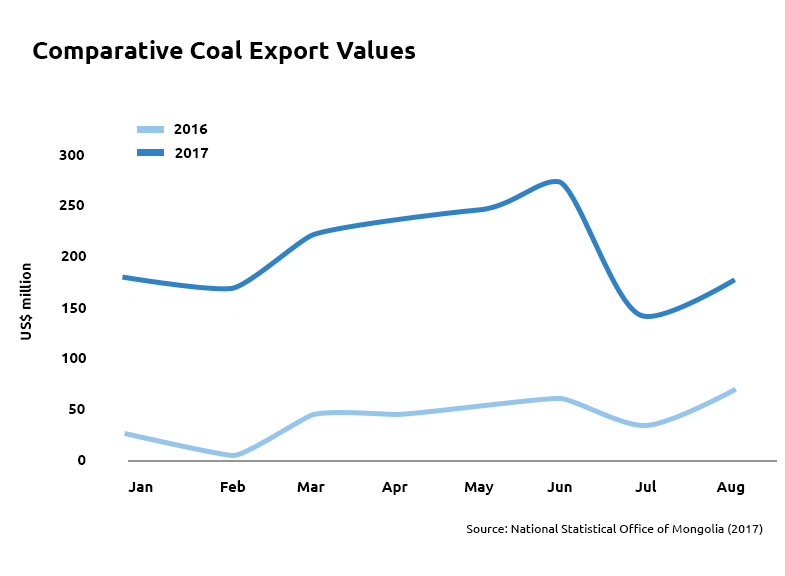 In a year, where coal export volumes are up 68% in the year to August – reflecting values 274% greater than the same period of 2016 – miners are ramping up to operate at full capacity by 2018 (NSO). The coal trade, which began to grow in the last quarter of 2016, has continued its momentum, with a 44.3% increase in trade with China in the first half of 2017 alone (Reuters). Environmental restrictions in Northern China and long term water shortages mean hundreds of mines have been closed, leading to heightened demand for other sources to power continued industrialisation. Symbolic of this trend is an announcement by Shenhua Energy in August (Reuters). A major producer of coal in mainland China, it has ceased operations at two large open pit mines, citing ‘land requisition delays’ as instrumental in its decision (Reuters). The two mines at Ha’erwusu and Baorixile produced 3 million tonnes in January-July of 2017 alone, according to reports (Reuters). The likely shortages are predicted to benefit Mongolia. More important perhaps, is this may provide an opportunity for upward price revision for Mongolian coal, since levels are below those charged by other exporters to China due to issues of transportation (Reuters). With continued difficulties for Chinese coal producers, Mongolia’s miners are looking to increase capacity. Gotov Battsengel, chief executive of a subsidiary of Mongolian Mining Corporation, recently stated his company’s intention to produce up to ten million tonnes of coking coal next year – double the output for 2017 (Reuters). Its coal washing plant is due to operate at full steam by 2018 due to anticipated demand (Reuters). Figure 2 shows the value of Mongolian coal exports in 2017 versus the same period of 2016. After a slow start to the year, copper pricing had a positive few months. Mongolia has the thirteenth largest reserves in the world and, outperformance in this area, can have a disproportionate effect on the health of the Mongolian economy. There are two factors most relevant to the development of this industry. Firstly, a settling consensus of the role copper will play in the development of electric cars and components used in new technologies. A recent report by the International Copper Association (ICA) pointed to a nine-fold increase in global demand by 2027 – which if delivered, would be of real consequence (Reuters). Secondly, Turquoise Hill Resources, charged with the delivery of the massive Oyu Tolgoi mine, has committed to spend US$2.4bn in 2018-2019, enabling the miner to access higher grades of copper, and contribute 30% of Mongolian GDP once full production at the mine is achieved in 2020 (Turquoise Hill Resources). 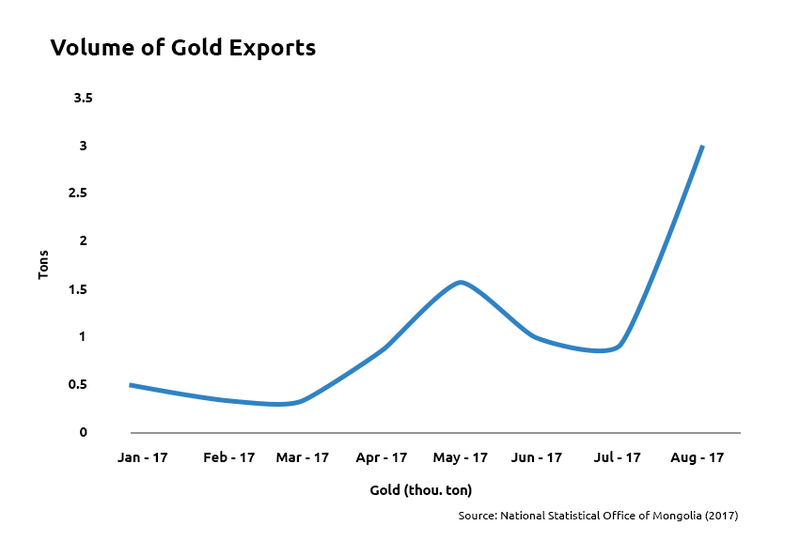 Gold – an industry still in its infancy – is beginning to make its mark. It performed exceptionally in the latter part of 2016 and early months of 2017, before slowing in the period which followed. We are awaiting the latest data for September, however, in July and August there was a 56% increase in production compared with 2016, whilst the values rose 47%.19 Taking August in isolation, the volume of exports was up 173% compared with August 2016, and the value rose 155% (NSO). 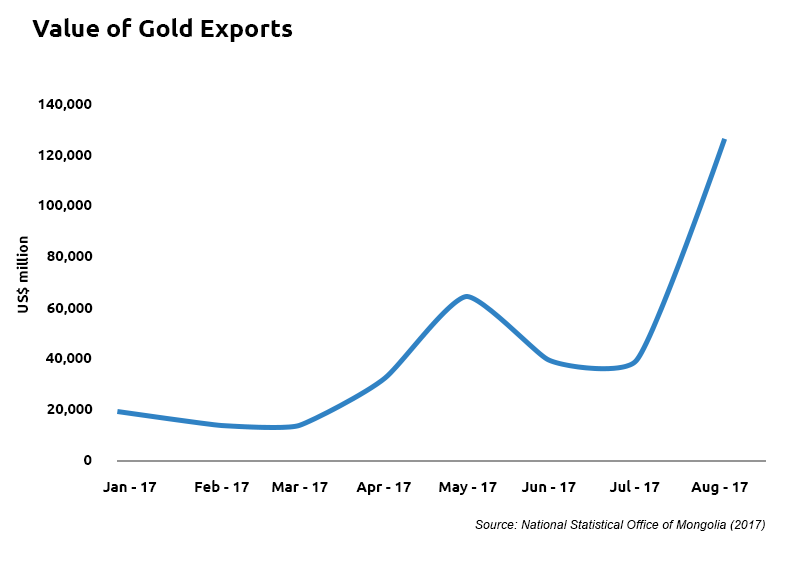 With increased global uncertainty, both geopolitical and economic, gold may increasingly be seen as a safe haven investment. The performance in value and volume terms is show in Figures 3 and 4. The strong consolidated performance of commodities in 2017, was reflected in the shares of Mongolian Mining Group (MMG). It reported profits of US$375m in the first half of the year compared with a loss of US$61.7m in the same period of 2016 (SCMP). This change led to shares surging by as much as 34% in the day prior to the announcement of half year performance. One of the most significant announcements in recent months, though, came from unexpected quarters. Chile is the largest producer of copper in the world, and the largest company engaged in extraction and production, is Codelco – owned by the state. Recognizing an uptick in performance of the commodity, Codelco’s CEO Nelson Pizarres, told Reuters, it was preparing to invest in development stage projects in Mongolia. Terming these ‘medium term’ investments, Codelco’s movement is telling, since though the potential of copper in Mongolia is widely acknowledged, there are few projects of scale, with significant financial weight behind them. Kincora has featured widely in the press in the last quarter. The Canadian firm raised C$4.5m through a placement for drilling purposes at its East Tsagaan Suvarga and Bayan Tal sites. Sam Spring, Kincora’s chief executive cited improved copper pricing and the quality of its prospects as reasons underpinning investor confidence in the company (Junior Mining Network). Following this announcement, it was reported the European Bank for Reconstruction and Development (EBRD) would take a 6.16 % stake in the company for a consideration of US$1.1m (EBRD). In usual circumstances this could be considered an unremarkable corporate announcement, however, it is notable since the EBRD does not typically engage in transactions of this nature. Generally, it will only fund established, operational projects, perceiving reduced risk, however, it has justified involvement on the basis of an ‘exploration gap’ as a result of recent economic difficulties. Xanadu, is also increasing its exploratory activities. It announced the identification of three new large porphyry targets at its Kharmagtai project (Proactive Investors). Works are understood to already be underway to vector towards high grade deposits (Proactive Investors). Companies which have not previously featured prominently in news concerning Mongolia, have also begun to register on the radar. Cairn Energy, the UK listed explorer, reported strong revenues in the first half of 2017 – its success in part derived from royalty payments from Petrochina on producing fields in Mongolia (Insider). Such developments, point to renewed activity in Mongolian mining, and an appreciation of the as yet untapped potential of much of the sector. Constructive relations between Ulaanbaatar and Beijing continued in the third quarter of 2017. In 2015, the Chinese and Mongolian governments agreed to create a cross border economic zone in Erenhot, Inner Mongolia and Zamyn-Uud, Mongolia (China Daily). There is renewed impetus, since construction has now begun on the Chinese side, which will be followed by Mongolian investment. Incorporating nine square kilometers on each side, China’s 22MCC Group has been instructed to deliver the first US$125m of works. A further statement of the drive to ensure smooth passage of cargo through improved infrastructure was provided by the announcement the Russia-Mongolia-China transport corridor would be operational by 2018. Russian Transport Minister, Maxim Sokolov announced three crucial areas would be pursued – the central railway, organizing transit trucking on the Tianjin – Ulan Bator-Ulan Ude route and improving paving (China Daily). On the back of earlier announcements in the second quarter as to the commission of new roads between 2018 and 2020 – including the widening of the 205km stretch between Ulaanbaatar and Darkhan – infrastructural improvements are well under way. This – and other measures – will help alleviate current strains, which in part, mean one of the longest traffic jams in the world at the border between Mongolian and China. In our last update, we referenced the election of the new president, Khaltmaagin Battulga. Hailing from the Democratic Party (DP), Battulga rode a wave of populism that left some commentators concerned about his possible interaction with the IMF and other international partners. The great distinguishing feature of his tenure, to date, however, has been pragmatism. Whether in his interactions with China, the IMF or others, he has shown himself to be consultative, conciliatory, all the while adhering to campaign promises to push for more even distribution of the spoils of growth. In contrast to the insularity some observers feared, Battulga has sought to broaden interaction with international partners, including China. Indeed, in September, he used a speech to argue that with investment it would be possible to ‘multiply’ Mongolian agricultural exports (Reuters). Currently only 1% of the country’s landmass is used for farming, but it is thought this could increase to 3% (Reuters). Battulga is imploring his colleagues in the legislature to act so as to exploit foreign markets, and diversify the base of the Mongolian economy. His blitz of engagements with foreign diplomats and dignitaries has pleased many in the Ulaanbaatar business community. Just as the excitement of the presidential election passed, attention focused on the parliament and the then incumbent Prime Minister, Erdenebat. Following political infighting and allegations of corruption, involving US$350m of contracts, the Mongolia People’s Party (MPP), announced a replacement in late September. Ukhnaa Khurelsukh, formerly Acting Deputy Prime Minister, was elected from a field of three candidates with 64% of the vote (Washington Post). Like President Battulga, Khurelsukh is charismatic and known for his unconventional, and ambitious, approach to political life. A sometime chair of a local Harley Davidson club, and known by the nickname, ‘Fist’, it is hoped his election will bring some cohesion to the MPP. In a notable rebuke to predecessors, the Prime Minister has placed corruption at the center of his agenda and told businesses not to come to him seeking special dispensation. Whatever his ultimate performance, the settlement of this political impasse is likely to be welcomed by international observers and businesses alike. After a pause, brought about by political turbulence, the enactment of the IMF deal and attendant reform are now back on track. In the third quarter, IMF changes have continued to take effect, in particular, regarding banking. As part of the IMF deal, it was asked to ‘make a comprehensive effort to rehabilitate the banking system (Reuters). An asset quality review is underway and new regulations are afoot to improve governance. A so-called ‘certificate of health’ for the system is likely to be greeted positively by investors. Difficulties with non-performing loans and bad debts, dented confidence in its overall integrity, raising questions as to resilience in the face of exogenous economic shocks. The Mongolian stock market – though relatively small and thinly traded – provides a guide to increased confidence in the country. The top twenty companies on the Mongolian Stock Exchange (MSE) have increased by 45% in value since the start of 2017, to reach levels not seen since 2012, when the economy grew 12.3% (Bloomberg). Total market capitalization has for the first time exceeded two trillion tugrik, in part, owing to the significant increase in coal exports (Bloomberg). Though this is only one indicator of economic health, it is nonetheless, an encouraging development. Two notable performers were the partly state owned coal company, Tavantolgoi JSC, and the drinks producer, APU JSC. It is no secret, local stock exchanges are one of the first places foreign investors look when hoping to gain exposure to growth markets. This trend is shown in Figure 5. As previously referenced, a central focus since the IMF deal has been the restructuring and payment of debt, so as to allow Mongolia to benefit more broadly from the economic recovery. Erdenes Tavan Tolgoi, the government owned entity, has now repaid all outstanding debt to Aluminum Corporation of China (CHALCO) – a figure that once amounted to US$350m.42 MMC, meanwhile, has also successfully restructured US$900m of debt (Montsame). Following a difficult few years that led to enforcement action by one of its creditors, PWC was instructed and a successful multi-jurisdiction deal was achieved that became effective earlier in the year. Both significant moves, mean these strategically important companies are positioned to take better advantage of recovering commodity pricing and an uptick in demand from global partners. Expatriates are returning to Ulaanbaatar in significant numbers – net foreign arrivals were up 41% in the first half of 2017 alone (NSO). On a monthly basis, the figure is even more striking. As we wrote recently for Newsweek, this is exerting upward pressure on rents in the best buildings. As firms look to initiate or accelerate industrial activity in Mongolia, they need to house workers in ‘prime’ units. Though carcasses of stalled developments are still too visible in many parts of the city, new delivery is lacking. Faced with the choice of housing incomers in costly hotels or much cheaper prime schemes, corporates are invariably choosing the latter. With prices suppressed compared with the peak, investors are enjoying low voids, and high yields of between 9-12% according to our management business. 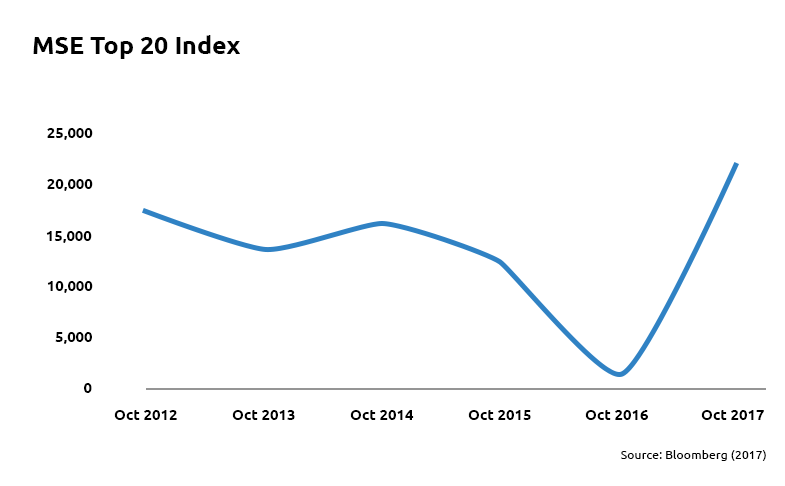 The recent August bulletin of the housing index reinforces the rental story. In the mass market category, prices are down even when compared with last year, and up only 0.88% since 2013, when studies were initiated (Mongol Bank). In essence, values are not yet reflecting improved economic conditions, apparent in most other parts of the economy. Investors are benefitting from a lack of competition for purchases, since multinationals have little appetite for acquisition and prefer to underwrite rents and corporate housing packages. Another factor driving the Ulaanbaatar residential market – especially in Sukhbaatar and Khan-Uul districts – is the failure to resolve the mortgage program. The state-subsidized 8% system, enabled home ownership for an increased number of Mongolia’s middle class. Financial difficulties, led to its effective discontinuation, meaning, individuals in good jobs, at good companies, are residing in the rental sector. Mortgage penetration remains low in a cash market and this competition for the finite number of prime units, is pushing yields higher in prime schemes. In the retail sector, the picture is similarly nuanced, in the sense it is unhelpful to describe the market in general terms. Occupancy remains low in some of the city’s flagship malls, however, in select buildings at lower price points, with landlords flexible as to occupation, returns can be upwards of 12%. Statistics suggest there has been a 340% increase in incomes in Ulaanbaatar since 2007, meaning a growing consumer class (NSO). With a number of retailers such as Lotteria and E-Mart committing in recent months, a marriage of consumer and operator confidence, could mark the beginning of meaningful recovery for retail property. The move toward a more diversified and green economy for Mongolia continues apace. Policymakers have expressed their intention to generate 20% of its energy from renewable sources by 2020, and 30% by 2030. The Green Climate Fund has announced US$8.65m for a solar park, known auspiciously as Renewable Energy Programme #1 (Renewables Now). Once delivered, the project will provide 10MW of power in the Soumber sum of Govisumber Province in the South of Mongolia (Renewables Now). This is a welcome move in a country with vast open spaces, and a reputed 350 days of sunshine per annum. Wind energy is also beginning to transition from being an honorable intention, into something, that in time, can make a meaningful contribution to the Mongolian economy. Clean Energy Asia, in partnership with Newcom and SB Energy, announced commercial operations have now begun at its windfarm located in the Gobi. The project is notable for being the first US dollar denominated transaction by the Japanese International Cooperation Agency (JICA), signalling support for a transition toward a balanced energy future. Mongolia’s scenery has frequently been cited by international periodicals and travel journals as one of the last great frontiers for independent travel. With the renewed focus brought by the IMF package earlier this year, Mongolian authorities are looking to breathe life into this industry. In late September, Mongolia participated for the first time in the Tourism Expo in Japan. Accompanied by a series of tour operators active in Ulaanbaatar, Secretary of State at the Ministry of Environment and Tourism, Ts. Tsengel, is encouraging investment in the sector. Sustainable energy improvements, up to €4.5m. In a similar vein, the EBRD loaned the microfinance institution, Transcapital, MNT6 billion, with the aim of providing further funds to small enterprises in poor parts of Ulaanbaatar and further afield (The Financial). The relationship between Transcapital and the EBRD has existed since 2013, and the new facility – denominated in Tugrik – enables small businesses to avoid foreign exchange risk. Both these moves, will help move toward a more diversified economic base in Mongolia. Just as this publication was going to press, Golomt Bank obtained a long term loan from World Business Capital (WBC) and the U.S. Overseas Private Investment Corporation (OPIC) (Montsame). Designed to help develop SMEs in Mongolia, especially in the area of agribusiness and environmentally friendly projects (Montsame). Welcoming the announcement, Golomt’s spokesman highlighted it would extend beyond outstanding sovereign bonds and mark a significant development for Mongolian business. Turning briefly to agribusiness, business recognizes it could be an important contributor to a more sustainable future. Long recognized as a potential powerhouse, Poland has made moves to support its development. A soft loan of €50m from Warsaw, will involve €32m to be spent on agriculture (AKI Press). In particular, the Polish company, POL-MOT Holding JSC, has asked – and received support – for the construction of a tractor factory assembly plant (AKI Press). Collectively, there is much to cheer in the country’s drive to diversify, and further opportunities abound. Mongolia continues to take a more active and engaged role on the world stage. One strategic relationship of particular importance is that of China. Prior to the election of Battulga, detractors cited supposed economic nationalism, as a potential impediment to close cooperation. In practice, relations have been cordial. Xi Jingping and Battulga have frequently congratulated each other on notable milestones and expressed their intention of closer bilateralism (Xinhua). The China-Mongolia Expo held in Hohhot in late September, further helped in forging partnerships between the private and public sectors in Mongolia and China (AKI Press). Another reliable and supportive partner, is South Korea.In the midst of geopolitical uncertainty, especially on the Korean peninsula, its new administration has expressed an intention to further cultivate relationships with other Asian countries. The South Korean deputy prime minister, has expressed his hope of ‘widening person-to-person and trade ties especially with the Far East, as well as with China and Mongolia (Sputnik). Such moves, have been welcomed by the business community. Mongolia’s efforts to project influence, however, have not been confined to large neighbors, nor economic heavyweights. It was recently announced, Mongolia has signed a civil aviation agreement with Myanmar for the first time, opening up the possibility of flight routes between Yangon and Ulaanbaatar (Eleven Myanmar). As two countries with dynamic, and at times, fast growing economies, it is a welcome step, for those already invested in both frontier markets. Another country looking to increase interaction, is Belarus. The Belarus-Mongolia joint commissions has increased its activities and in January-June there was a significant increase in Belarusian industrial exports. On a multilateral basis, it was recently announced a free trade agreement with the Eurasian Economic Union (EAEU) could be concluded in 2018.65 At the Eastern Economic Forum, the Russian Natural Resources Minister, Sergey Donskoy extolled the virtue of a potential pact, highlighting how 70% of growth derives from interaction between neighboring economic blocks. Drawing on the experience of the visa-free regime between Russia and Mongolia since 2014, Donskoy, was cautiously optimistic of the potential of concluding arrangements. Now is not the time for misplaced optimism, nor hope of a return to growth rates in excess of 15%. In fact, there is good rationale for hoping Mongolia sees annual expansion at a lower but sustainable level. The figures, though, keep coming in, pointing to strong momentum. The National Statistical Office of Mongolia recorded growth in excess of 5% in the first half of 2017 (NSO). The ADB, revised expectations up from 2.5% to 4% by year end (ADB). The IMF maintains its prediction of 8% growth by 2019. Mongolia is still a commodities-driven economy, and happily, this year has seen a rebound in global demand. The performance of coal has been exceptional. Investment is setting the scene for Mongolia’s enormous copper reserves to provide the components needed for new technologies and electrification of vehicles. And with geopolitical turbulence, gold may increasingly be sought as a safe haven asset by spooked investors. With 20% of Mongolia’s landmass available for exploration, Codelco, Kincora, Rio and others, are preparing for heightened activity. With the thirteenth largest copper reserves in the world, and, the mantle of second largest exporter of coal to China, a buzz is returning to Ulaanbaatar. Unlike previous booms, however, neither public nor private sectors are sitting idly by. Few hope to be passive beneficiaries of these trends. President Battulga and Prime Minister Khureksukh, both charismatic, reformers, may differ in political hue, but share a mind to entrench the recovery. The ‘One Belt, One Road’ initiative continues apace, debt restructuring is enabling producers to benefit from preferential pricing, and the stock market is at record highs. Married to support for small business and the IMF program, and investment in a diversified economy, necessary preparations are underway. 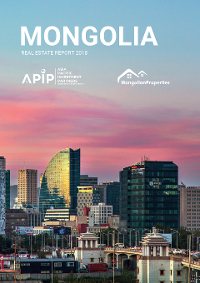 As participants – public and private – watch the economic story unfold, there’s a sense Mongolia could once more become the darling of international investors. For help navigating opportunities in Mongolia, please contact Andrew McGregor (andrew@apipcorp.com) or Lee Cashell (cashell@apipcorp.com).